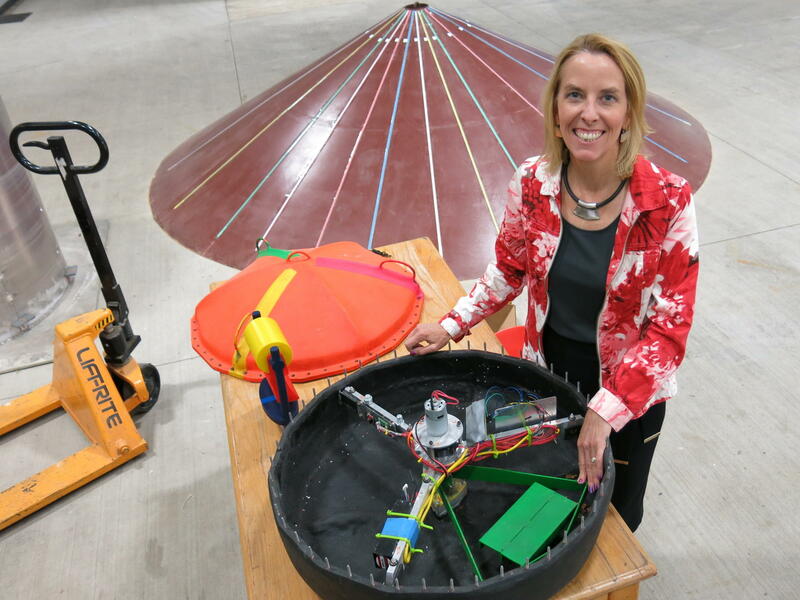 Belinda Batten of Oregon State University stands in front of a wave energy generator prototype. Think "renewable energy" and the wind and sun come to mind, but someday it may be possible to add ocean energy to that list. The fledgling wave energy industry is getting a boost from the federal government. The Department of Energy is spending up to $40 million to build a wave energy test facility off the Oregon coast. Wave energy has a long way to go before it's ready to power the lights in your house. At this point, engineers aren't even quite sure how best to capture the power of the water. "We don't know what the right kind of wave energy converter is," says Belinda Batten, executive associate dean of the College of Engineering at Oregon State University. Batten says part of the challenge is that the ocean moves in different directions depending on the location. "It goes up and down when you're out in the water," she says. "As you're getting close to the coast, it's going back and forth in surge. Within the ocean, the particles go around in circles." Batten has a collection of models of the various wave energy converter prototypes the industry is considering. A video demonstrating how some of the generators would work is here. Batten says OSU's Northwest National Marine Renewable Energy Center will build the new offshore test facility. It will be connected to the power grid by underwater cables. She says it should help speed the industry's progress in testing various styles of machines. But this testing can only go so far. "You need the full-scale wave energy converter out there for some time to prove that it's going to survive [and] to prove what its cost of energy is," says Batten. Then she says companies will have a better chance of attracting venture capital that will help the industry grow. Wave energy supporters like Jason Busch are excited. He heads the Oregon Wave Energy Trust, which estimates 10 percent of the world's energy could come from the ocean. "Marine renewables is a vast opportunity. The amount of energy that's in the ocean available for us to utilitize is massive. And it's right there — it's right off our shores," says Busch. The technology will be expensive at first and Busch says more research is needed on the environmental effects of wave energy. "But the only way to do that is, of course, getting the machines out in the water and monitoring them for a longer period of time," says Busch. The new test facility will make that possible. The fishing industry also has some worries about whether wave energy will interfere with their business. That's why OSU consulted fishermen to figure out exactly where to build its offshore test facility. They found a location about 6 miles off the coast of Newport, Ore. Construction is expected to start in 18 months. The university hopes to begin testing in 2021. I say renewable energy and you probably think wind or maybe the sun. You might be able to put the ocean's waves on that list, too. The Department of Energy is experimenting with this idea. The department is spending $40 million to build a test facility off the Oregon coast. Here's NPR's Jeff Brady. JEFF BRADY, BYLINE: Wave energy has a long way to go before it's ready to power the lights in your house. In fact, Belinda Batten of Oregon State University says engineers aren't quite sure how best to capture the power of the water. BELINDA BATTEN: If you think about the motion of the ocean, it goes up and down when you're out in the water. As you're getting close to the coast, it's going back and forth in surge. Within the ocean, the particles go around in circles. And so we don't know what the right kind of wave energy converter is. BRADY: Batten says the new offshore test facility the federal government is largely financing will help the industry develop. There is research underway now. At Oregon State, it happens in a cavernous gray building with a concrete tank that's almost as long as a football field. Pedro Lomonaco directs OSU's Wave Research Lab. PEDRO LOMONACO: So we will run a wave for you now. BRADY: First, you'll hear the big engine that makes the wave and sends water through the tank. BRADY: Then the wave heads toward us. BRADY: Lomonaco says so far they've tested model versions of wave energy converters. LOMONACO: And we will see how it responds to the waves and how much energy we can capture from them. BRADY: But this testing can only go so far. Belinda Batten says it's important to get out in the ocean. BATTEN: You need that full-scale wave energy converter out there for some time to prove that it's going to survive, to prove what its cost of energy is, and that's also important to attract venture capitalists. BRADY: For the small companies involved in wave energy now, it's too expensive to build their own test facilities. That's why the federal government is largely funding the project about six miles off the central Oregon coast. Wave energy backers like Jason Busch are excited. He heads the Oregon Wave Energy Trust, which estimates 10 percent of the world's energy could come from the ocean. JASON BUSCH: Marine renewables is a vast opportunity. The amount of energy that's in the ocean available for us to utilize is massive, and it's right there. It's right off our shores. BRADY: There are a few concerns. The technology will be expensive at first, and Busch says more research is needed on the environmental effects of wave energy. The fishing industry also has some worries. In deciding where the offshore test facility should be built, Oregon State involved fishermen to make sure it didn't interfere with their business. I met Terry Thompson at the docks in Newport. He's a county commissioner and fisherman and says it took some time to get his busy colleagues together in one room, but once they did, picking a location was easy. TERRY THOMPSON: We don't fish there. Everybody in the room looked around and says we don't fish there either. Ten minutes after we met, here's your site (laughter). BRADY: Sounds like you all needed to have a conference call (laughter). THOMPSON: No, we - no, fishermen don't do conference calls. Fishermen do face to face. BRADY: Construction on the new wave energy test facility is expected to start in 18 months. Jeff Brady, NPR News. Transcript provided by NPR, Copyright NPR.